West Tennessee State Penitentiary is a mixed custody state prison located in Henning Tennessee. It currently can house a maximum of 2,318 minimum, medium, and maximum custody adult male inmates. Offenders at this facility are provided medical, dental and mental health services. Additionally, inmates at West Tennessee State Penitentiary can take vocational classes in carpentry, microcomputer technologies, and masonry. This facility participates in the TRICOR industries program and employs inmates on a digital tag plant, a textile factory and a farm operation. West Tennessee State Penitentiary is comprised of three sites. Sites 2 and 3 are adjacent to one another and separated only by a series of fences. Site two is the location of the high security inmates, and consists of four units that are maximum, closed and disciplinary segregation, with an additional two units designated for medium security inmates. Site three is for minimum and medium security offenders. The minimum security unit is located just outside of these two sites and is sometimes referred to as the annex or as site one. Inmates also have access to alcohol and substance abuse treatment and can attend religious worship services for various religions. Inmates in the general population at West Tennessee State Penitentiary have visitation on Saturdays, Sundays and Holidays from 8am-3pm. Additionally, inmates who are unable to have visits on the weekends due to work conflicts can have visits on Mondays from 6pm-8pm. 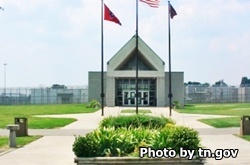 For more information on visitation at West Tennessee State Penitentiary read the visitors handbook.